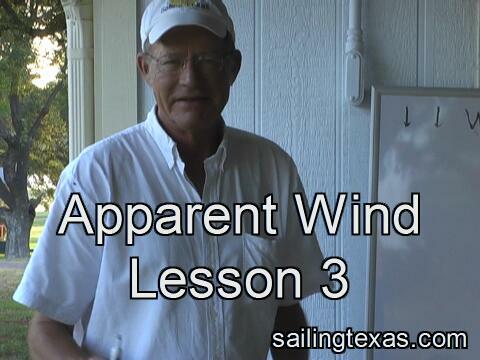 Apparent wind is the wind we use when sailing. It is the combination of the true wind and the wind created by the motion of the boat. The apparent wind can be faster or slower than the true wind, and it can come at a different angle, even 180 degrees different. Sailors know how these changes are created, and use their knowledge to increase the apparent windspeed and make it come across the boat at the speed and angle they prefer. Click image for Apparent Wind, Lesson 3, 65MB file. 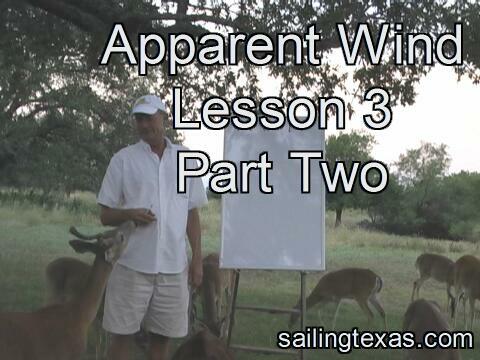 Click image for Apparent Wind, Lesson 3, part 2, 30MB file. Apparent Wind continued. Determining what the true wind is doing from the apparent wind and boat wind. If you know the apparent wind is the sum of the true and boat wind, you can subtract the boat wind from the apparent wind and get the true wind. This can be useful when the apparent wind makes an odd change. Sometimes the true wind has died, and all you see is the boat wind. What happens in a puff to the apparent wind speed and direction, and how to use it.